I can't really talk about this at present, as I'm meant to review this intriguing but occasionally narrow-minded biography for Spectrum Culture. Suffice to say, Massie's enthusiasm for Russian history is clear even without prior knowledge of his other books on various Russian leaders, and I am always both amused and deeply troubled to see just how eerily history constantly repeats itself in this vast, tortured country. 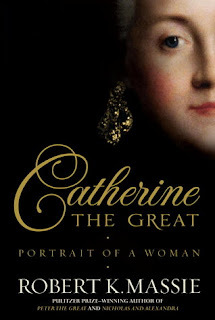 Massie routinely compares Catherine's rule to the other "great" tsar, Peter, but he could just as easily have linked elements of her reign and some reactions to it to the Bolshevik revolution, even Stalinism. I'll have more to say about the book later, but for now I'll just leave you with a timid endorsement. I'll make my reservations (and compliments) plain near the end of the month.